It’s been a while since my last post. A lot of changes both personally and professionally made it difficult to blog in past 12 months. But I’m back 🙂 and happy to share a new recipe that it’s perfect to enjoy the abundance of summer fruits. 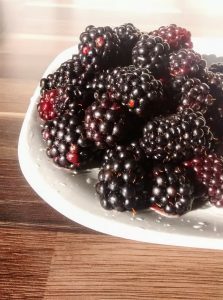 I’m not particularly green fingered but we have some scrumptious blackberries proliferating in our garden that I have no trouble growing as they just take care of themselves. 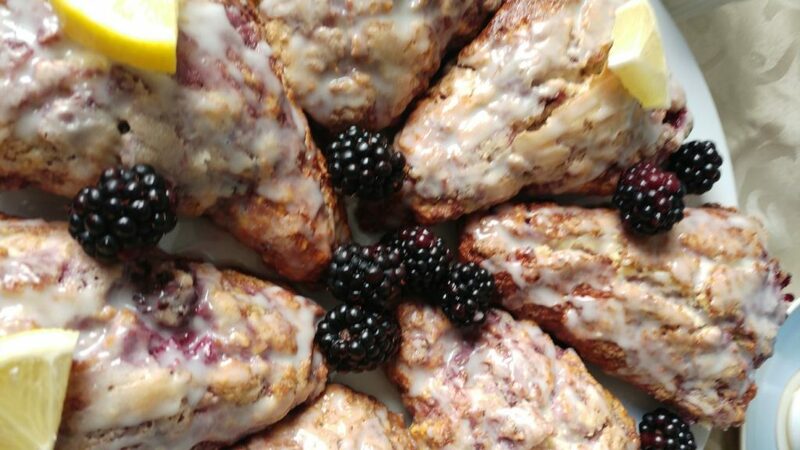 Enjoy these delicious scones made with freshly picked blackberries! In a large bowl, combine flours, zest, sugar, baking powder and salt. Add cold butter and work into the flour mixture until the biggest pieces are the size of small peas with either your fingertips or a pastry blender. Stir in blueberries, then milk, mixing only until large clumps form. Use your hands to reach inside the bowl and gently (so gently) knead the mixture into one mass. The more you knead, the wetter the dough will get as the blueberries break up, so work quickly and knead only a few times, if you can get away with it. Transfer dough to a well-floured counter and pat into a roughly 1-inch tall disc. Cut into 8 to 10 wedges, do not fret if the blueberries are now making a mess of the dough; it will all work out in the oven. Transfer wedges to prepared baking sheet, spacing them apart. Brush the tops of each with egg, then sprinkle with coarse sugar. Bake for 15 to 17 minutes, until scones are golden brown on top. Serve warm. I find most scones to be best the first day, but these were not bad at all on day two, gently rewarmed in the oven before eating. If freezing: I like to freeze scones unbaked and usually hold any egg wash until I’m ready to bake them. Simply spread the wedges on a baking sheet and chill until frozen solid and will no longer stick to each other, and pack tightly into a freezer bag. You can bake them right from the freezer; you’ll only need 2 to 4 minutes extra baking time. Meanwhile, in small bowl, mix glaze ingredients. Drizzle over scones. Serve warm. Andei bastante ausente pelo blog. Foram muitas as mudanças a nível pessoal e profissional que me impediram de estar mais presente por aqui. Mas agora estou de volta 🙂 e contente por partilhar convosco uma nova receita para saborear as frutas da época. Não sou particularmente dada a jardinagem, mas estas deliciosas amoras crescem no nosso jardim sem qualquer ajuda da nossa parte. 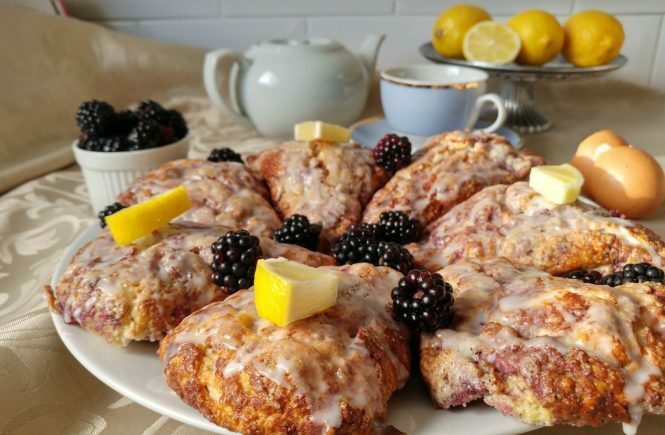 Estes scones são uma forma irresistível de aproveitar a abundância de amoras por esta altura! Pré-aqueça o forno a 200°C (180°C ventilado, 350°F, Gás 4). Forre um tabuleiro com papel vegetal e reserve. Numa taça larga coloque as farinhas, a raspa de limão, o açúcar, o fermento e o sal. Junte a manteiga fria e em pedaços e comece a amassar com as mãos até obter uma mistura areada. Aos poucos vá adicionando o leite ao mesmo tempo que vai amassando e até conseguir formar uma bola. Junte as amoras à massa e com as mãos envolva-as delicadamente e sem amassar demasiado. Se achar necessário junte mais um pouco de farinha. Transfira a massa para uma bancada enfarinhada, forme uma bola e achate-a ligeiramente. Corte em oito partes iguais e pincele com ovo batido. Polvilhe com açúcar mascavado e leve ao forno durante 15 minutos. Retire e deixe arrefecer sobre uma grelha ou saboreie ainda morno. 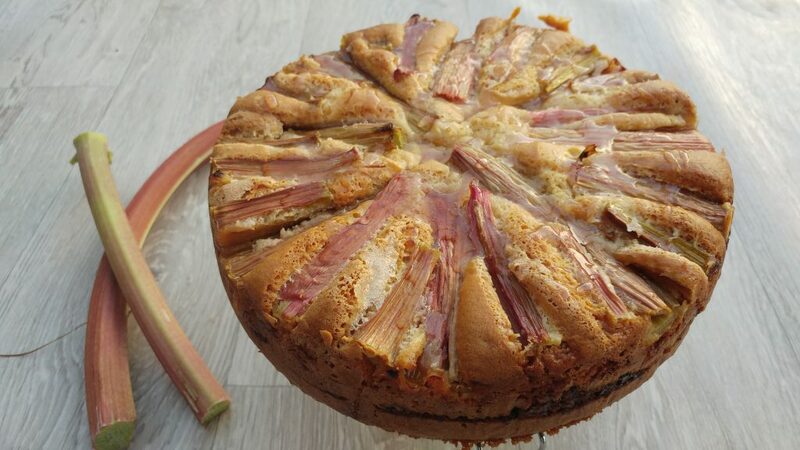 This cake represents the perfect marriage between two quintessential british flavours: custard and rhubarb. Before I moved to the UK rhubarb was pretty unknown to me and I can’t remember ever trying it. Also, the rhubarb was picked right from our garden and it is organic too! Start by making the custard. Blend the powder with the sugar in a small pan, and whisk in the milk. Bring the mixture to a boil and stir until thickened. Remove from the heat and add the vanilla extract, then set aside to cool slightly with a layer of clingfilm over to prevent a skin forming. Heat the oven to 160°C (140°C fan/ 325°F/gas mark 3). Lightly grease a springform cake tin and line the base and sides with baking parchment. 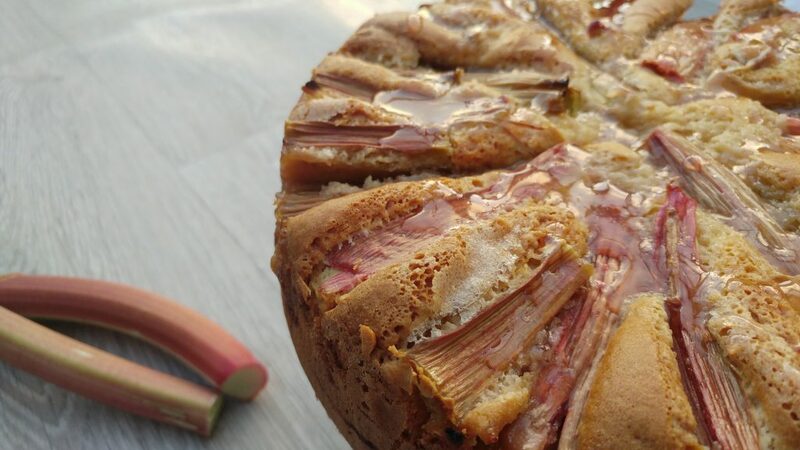 Cut the rhubarb into 8cm lengths so that they fit perfectly into the base of the cake tin, as shown in the photo (trim them if necessary). Toss the rhubarb with 3tbsp sugar and set aside. Combine the remaining sugar, eggs, oil, yogurt and vanilla in a large bowl. Beat until smooth. Sift the flour and bicarbonate into the misture and fold in gently. Spoon half the mixture into the tin, carefully spreading it right to the edges. Spread the custard over the cake mixture, then spread the jam on top of the of the custard layer. Dollop spoonfuls of the remaining cake batter over the custard and carefully spread the cake batter to completely cover the custard and jam layer. Arrange the rhubarb on top, keeping it away from the edges of the tin. Sprinkle over 1 tablespoon of the extra sugar. Cover loosely with a sheet of foil. Bake for 1 hr 30mins, then uncover and cook for 15 mins, until the cake is golden and firm to the touch in the middle. Leave in the tin to cool before transferring to a wire rack. 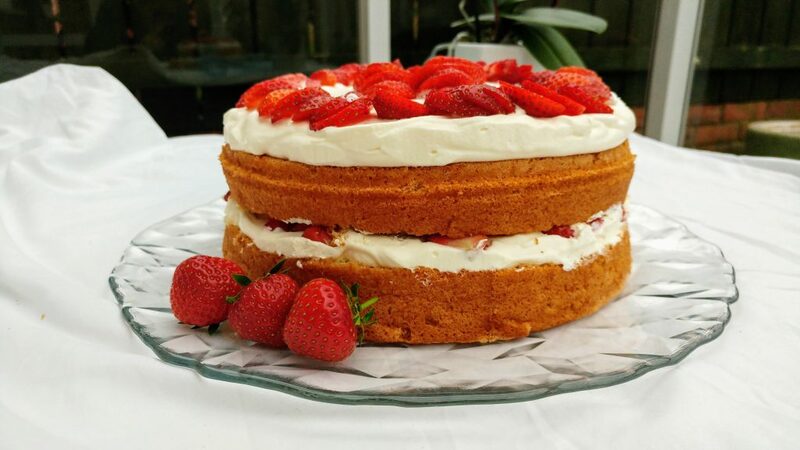 Este bolo representa o casamento prefeito entre dois sabores tipicamente britânicos: o ruibarbo e o creme inglês. Antes de viver no Reino Unido, este vegetal era um completo desconhecido para mim e não tenho memória de o ter provado anteriormente. Além disso, este ruibarbo veio directamente do nosso quintal e é biológico também! Numa panela pequena junte o pudim flan e o açúcar, misturando de seguida o leite. Leve ao lume até engrossar, mexendo sempre. Retire do lume, adicione o extracto de baunilha e deixe arrefecer, cobrindo o pudim flan com película aderente para não ganhar aquela capa dura. Pré-aqueça o forno a 160°C (140°C ventilado, 325°F, Gás 3). Unte uma forma de bolo com fundo amovível e forre o fundo e os lados com papel vegetal. Corte o ruibarbo em pedaços de cerca de 8cm, de modo a fazer o efeito que aparece nas fotos. Colocar o ruibarbo numa taça com as 3 de colheres de açúcar e deixar repousar. Bater o restante açúcar com os ovos, óleo, iogurte e baunilha. Adicione a farinha, peneirada com o bicarbonato, e misture delicadamente sem bater. Deite metade da massa na forma e com cuidado espalhe bem. Distribua o pudim flan sobre a camada de massa e espalhe o doce de ruibarbo por cima do pudim flan. Deite a restante massa na forma e espalhe cuidadosamente, de modo a cobrir completamente o pudim flan e o doce. Por fim, distribua o ruibarbo por cima da massa tal como mostra a foto, evitando que fique muito próximo dos lados. Povilhe com 1 colher de açúcar e cobrir com uma folha de alumínio. Leve ao forno durante cerca de 1h30 minutos. Passado este tempo retire a folha de alumínio e deixe cozer mais 15 minutos, até estar dourado ou firme no meio. Deixar arrefecer na forma completamente antes de servir. 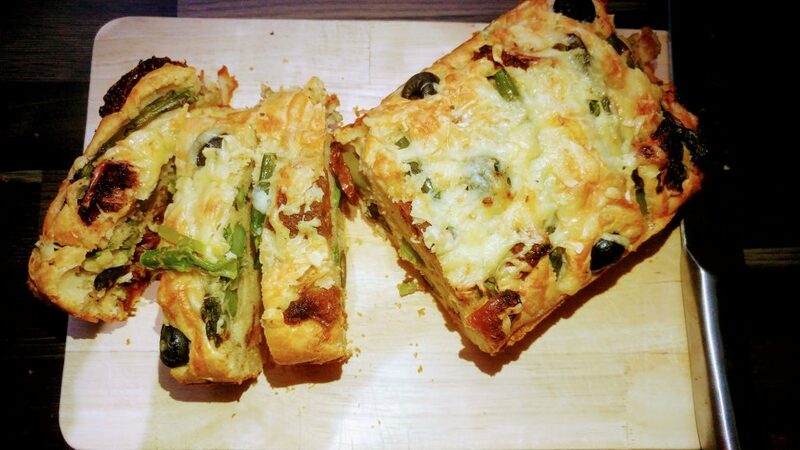 This loaf combines some of my favourite ingredients, resulting in a nice savory bake. We normally have it with soup for a light lunch/dinner or when dinner is running late and we need a snack to the rescue 🙂 It would also work really well as starter for your next dinner date! 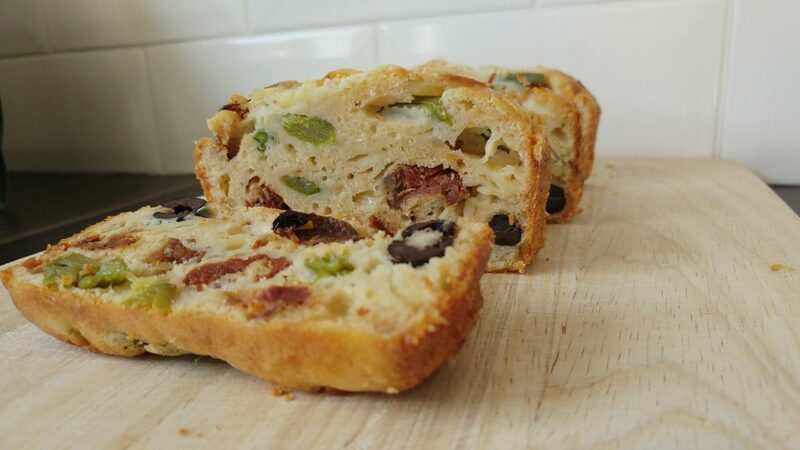 If you are looking for Mediterranean diet recipes, this loaf is also a great option as it uses vegetables, fruits, healthy fats (olive oil), and herbs instead of salt to flavor (thyme). Preheat oven to 190°C (170°C fan, 375°F, Gas 5). Oil and line the base of a loaf tin with baking paper. Cut the asparagus in 3 pieces and cook in boiling water for about 2 mins. Drain into a sieve and rinse thoroughly under cold running water, then pat dry with kitchen paper. Mix the flour and thyme in a large bowl and season with black pepper. Make a well in the middle and stir in the milk, oil and beaten eggs. Beat the mixture for 1 min to make a smooth batter. Reserve 5 asparagus tips, a few olives and sundried tomatoes. Add the remaining asparagus, tomatoes, olives and two-thirds of the cheese to the batter. Pour the misture into the tin, then put the reserved asparagus, sundried tomatoes and olives on top. Sprinkle with the remaining cheese. Bake for 35-40 mins until the cake is golden and crusty on top. Cool in the tin for 5 mins, then turn out and leave to cool on a wire rack. Este pão combina vários ingredientes super saborosos, que se traduzem num delicioso “bolo salgado”. Cá por casa costuma acompanhar sopas para um almoço/jantar ligeiro ou quando o jantar está demorado e é preciso algo para petiscar 🙂 Também é uma óptima solução para servir como entrada quando receber convidados para jantar. E, se por acaso estiver à procura de receitas da dieta mediterrânea, este pão é ainda uma excelente opção, uma vez que combina vegetais, fruta, gorduras saudáveis (azeite) e ervas aromáticas (tomilho) para dar sabor. Pré-aqueça o forno a 190°C (170°C ventilado, 375°F, Gás 5). 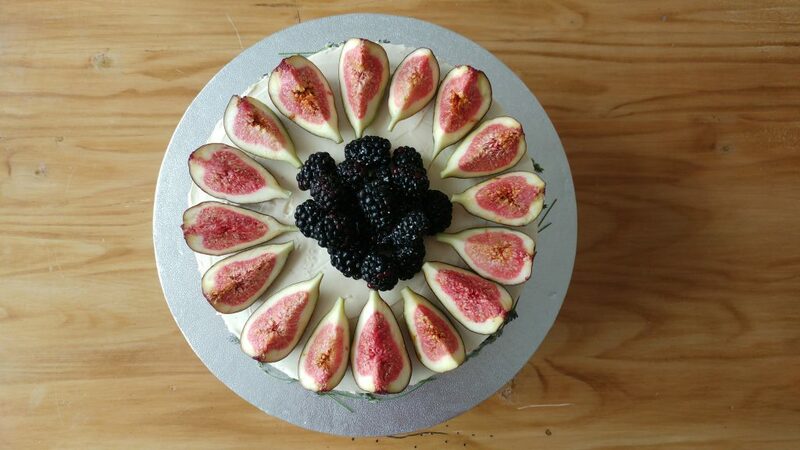 Unte com azeite uma forma de bolo inglês e forre-lhe o fundo com papel vegetal. Corte os espargos em 3 partes e leve a cozer em água a ferver durante 2 min. Escorra, coloque os espargos numa tigela de água fria durante alguns minutos, e por fim seque com papel de cozinha. Numa tigela grande, misture a farinha com o tomilho e tempere com pimenta preta. Abrir uma covinha no meio e adicionar o leite, azeite e os ovos batidos. Mexer muito bem com a colher-de-pau, durante mais ou menos 1 minuto até obter uma massa lisa. Reserve 5 pontas espigadas dos espargos, algumas azeitonas e 2 tomates. Junte os restantes espargos, tomates, azeitonas e 65 gr. de queijo à massa. Deite a mistura na forma e coloque por cima as pontas dos espargos, azeitonas e tomate que reservou. Polvilhe com o restante queijo ralado. Leve ao forno até estar dourado (aproximadamente 35-40 minutos). Deixe arrefecer durante 5 min na forma, depois desenforme e deixe arrefecer completamente antes de servir. I love sweet treats! and I always feel the need to have one after dinner. 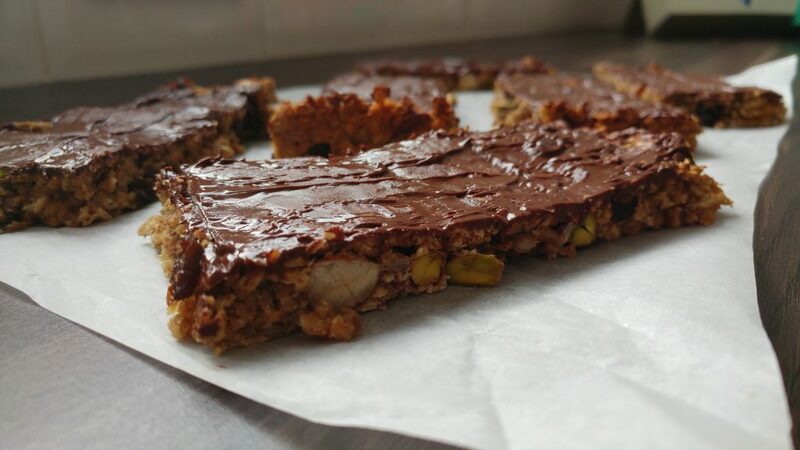 These bars are the perfect solution for my sweet tooth and a new favourite in our home. They also work wonderfully as a breakfast on the go, an afternoon snack or a pre-workout snack. They could even be a perfect addition to your lunch box: plenty of options! Using a blender make a purée from the banana, peanut butter and honey. Add the water to the peanut butter mixture and mix well. In a bowl combine the oats, nuts, sunflower seeds and dried fruits. Stir in the peanut butter mixture and combine. Line a roasting tin or a rectangular cake tin with parchment paper. Spoon into the prepared tin and smooth the surface, making sure it is evenly distributed. Bake in a preheated oven at 160°C (140°C fan, 325°F, Gas 3) for about 25 minutes, until golden. Leave to cool in the tin for about 5 minutes, then mark into 10/12 bars. Leave to cool completely before removing from the tin. If using the chocolate, put the chocolate into a bowl and microwave for 1 minute until melted and shiny (stir halfway). 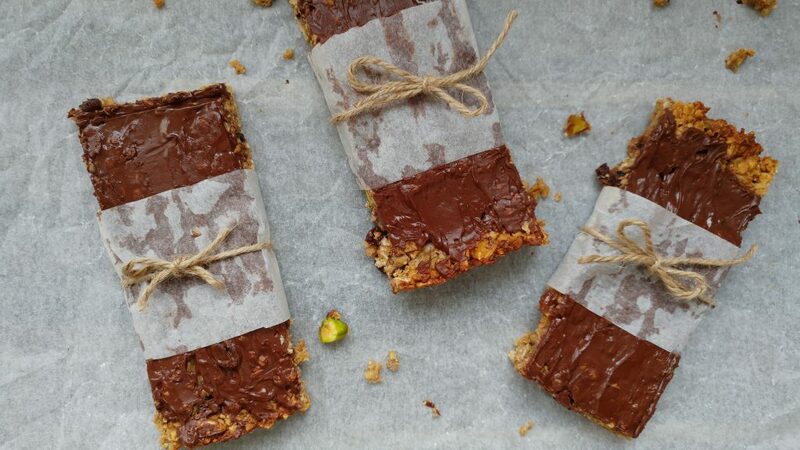 Drizzle over the bars and leave to set, then cut into 10 to 12 bars. You can store the granola bars in an airtight container in the refrigerator for up to 1 week. You can also freeze them. Adoro doces! São a minha perdição! e nada sabe melhor depois do jantar do que algo doce. Estas barras são a solução perfeita e são as nossas preferidas cá por casa. Também são deliciosas como pequeno-almoço “a correr”, lanche ou snack antes do ginásio. As opções são inúmeras e ao vosso critério! Com a ajuda de uma varinha mágica, triture a banana, a manteiga de amendoim e o mel. Adicione a água e envolva bem. Coloque numa taça a aveia, as frutas desidratadas, as sementes de girassol, as avelãs e os pistáchios. Junte a mistura de banana e manteiga de amendoim, envolvendo tudo muito bem. Forre um tabuleiro de ir ao forno ou uma forma de bolo rectangular (20 por 20 cm) com papel vegetal e de seguida, a adicione a mistura das barras de cereais. Distribua a mistura de forma uniforme e alise com a ajuda de uma colher molhada. Leve ao forno durante cerca de 25 minutos, até ficarem douradas, a uma temperatura de 160ºC (325ºF). Deixe arrefecer à temperatura ambiente durante 5 minutos, e faça marcas para 10 ou 12 barras. Deixe arrefecer completamente e retire da forma. Se utilizar o chocolate, leve ao microondas numa taça durante 1 minuto até derreter completamente e decore as barras a gosto. Leve ao frigorífico até solidificar. Corte em 10 a 12 barras. As barras podem ser guardadas num recipiente fechado no frigorífico até 1 semana. Podem também ser congeladas. Os dias ainda são de inverno e as manhãs ainda são frias (pelos menos por cá!). Nada melhor que um pequeno-almoço reforçado para nos aquecer o corpo e a alma. E estas papas de aveia são a solução perfeita. A melhor parte é que este pequeno-almoço pode ser preparado de véspera, demorando apenas 2 minutos no microondas para estar pronto. As papas de aveia são muito comuns por terras de sua majestade. Mas foram precisos 6 anos para eu aprender a gostar. E várias tentativas de confecção! O meu problema inicial era o facto de demorar algum tempo a preparar. O método tradicional de confeccionar na panela era demasiado demorado para uma pessoa pouco madrugadora como eu. Já utilizando o microondas era mais fácil mas normalmente resultava numa explosão de papas de aveia dentro do microondas. Assim, quando descobri esta forma de fazer papas de aveia todos estes problemas iniciais ficaram resolvidos. Misturar bem os frutos vermelhos, a aveia e a água. Ajustar se for necessário (deve ficar cremoso!). Se estiver muito espesso, adicionar água. Na manhã seguinte levar ao microondas durante 2 minutos. Antes de servir adicionar o mel. 100 ml. de água ou leite. Misturar bem a banana, o chocolate, a aveia e a água. Ajustar se for necessário (deve ficar cremoso!). Se estiver muito espesso, adicionar água. Na manhã seguinte levar ao microondas durante 2 minutos. It still feels wintery outside and the mornings are still cold (at least up here!). And the perfect solution to warm your body and soul are some overnight oats. This breakfast can be done the night before and it only takes 2 minutes in the microwave to be ready. 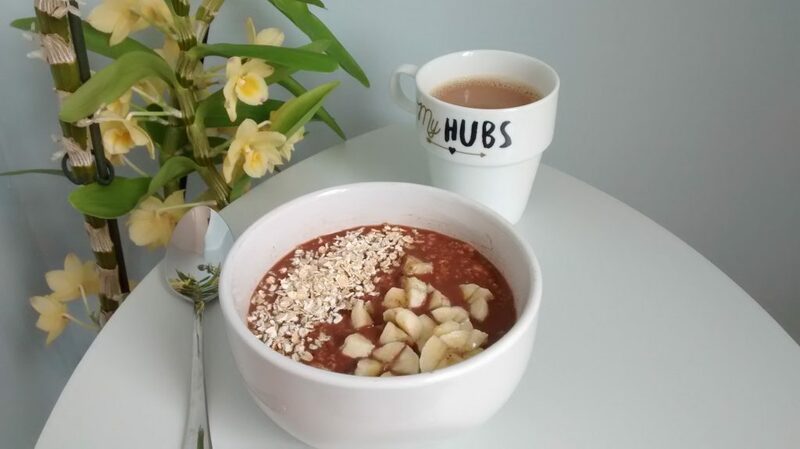 Having porridge for breakfast is very common in the UK. However, it took me 6 years to learn how to enjoy it. My initial problem was how long it would take do it on the hob, which is a lot of effort for someone that isn’t a morning person. Also, I learnt the hard way how microwaving porridge could easily result in a mess. Thankfully overnight oats solved all these issues! Mix the summer berries, oats and water. Adjust if necessary (it should have a creamy consistency). If too thick, add a few drops of water. In the morning put it in the microwave for 2 minutes. Add the honey before serving. 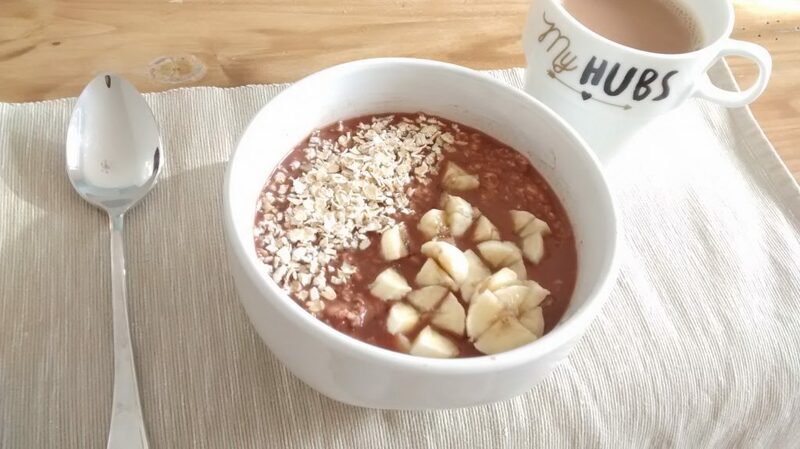 Mix the banana, chocolate, oats and water. Adjust if necessary (it should have a creamy consistency). If too thick, add a few drops of water. In the morning add a dash of milk and put it in the microwave for 2 minutes. And so it has been since I’ve cooked my first dish! This blog is something I’ve always wanted to do and has been in the pipeline for a while. 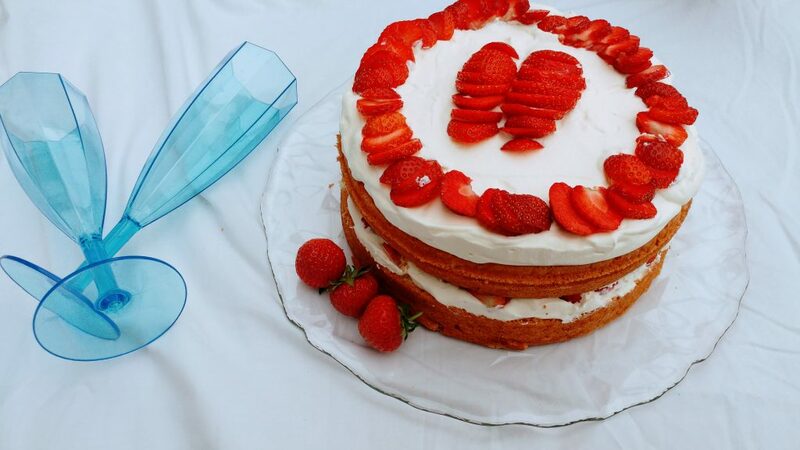 Here I hope to share recipes and food made with love. E assim tem sido desde que me lembro do primeiro prato que cozinhei! 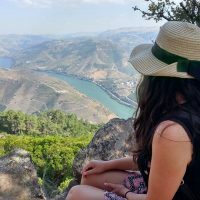 Este blog é um projecto há muito adiado e que finalmente se materializa. 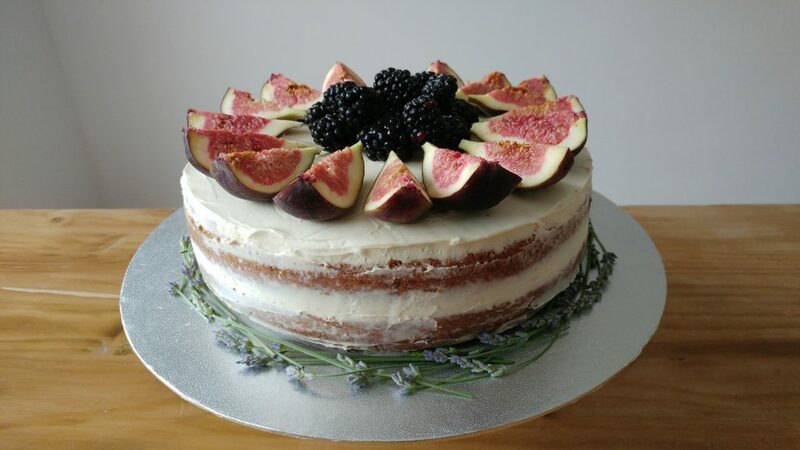 Aqui espero partilhar receitas feitas com amor.